Discussion in 'People & Portraits' started by Rob MacKillop, Jan 24, 2013. I've been asked to give a talk to the Edinburgh Bibliographical Society in March 2014 on the so-called Guittar in Edinburgh, 1750-70. I have an original guittar, which is tuned to a C Major chord (should you be interested) and was fashionable for twenty or thirty years before the Spanish guitar - the more 'normal' guitar - came into Britain. I recorded some music for it on some of my albums. 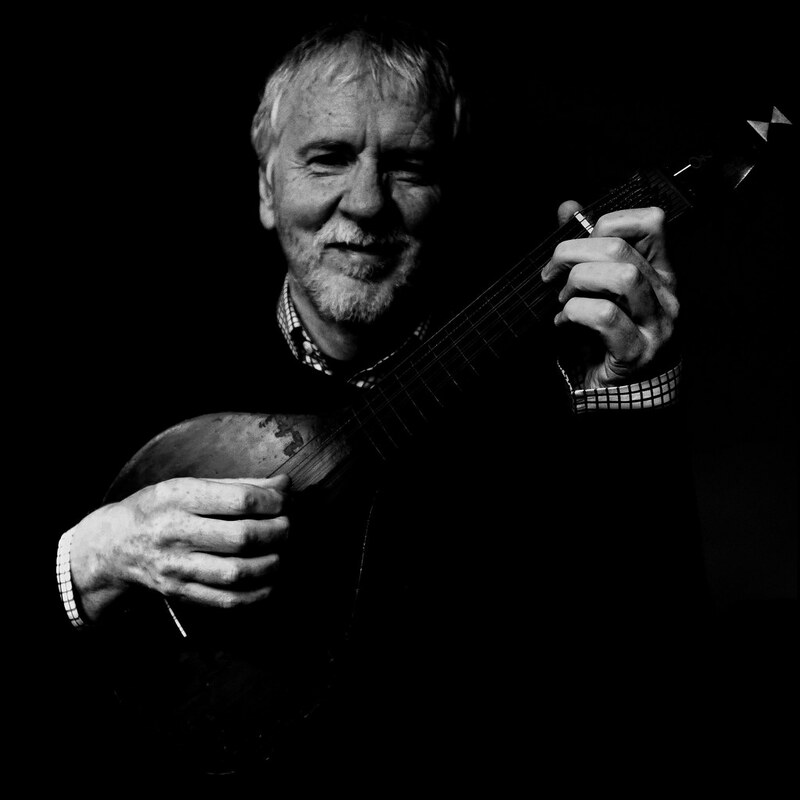 One album is now out of print, but you can download free files on my website here: Cittern | Rob MacKillop ~ Musician - scroll down. Anyway, the guy who invited me asked for a recent picture of me with said guittar. I didn't have any younger than a decade ago, so quickly put these together. I'll send him the first, as it shows the instrument more clearly. Note the odd tuning machine at the top. It's called a watch-key mechanism. A watch key turns a screw, which tightens or slackens the string. Ingenious, and it works beautifully. Interesting Rob and I like the second shot a lot. Now, if I were to be critical (perish the thought ), my criticism of the first would be eyes! They should be absolutely sharp. And I think you are leaning forward too much - you appear to be peering into something (a camera or iPad I would guess! ). Hope you don't mind. I'm in a critical mood today I'm afraid. I just took some shots to illustrate the effect of tilt. And they are rubbish; lighting, angle, content... So please feel free to ignore Mr Grumpy! Rob I am sure if this pic was on the poster advertising the Edinburgh Bibliographical Society talk, many will see a handsome young guy and you will need to arrange extra seating. The serious side of this , is , will the pic be used in this manner or for the local paper? Both are good pictures but as Pete points out maybe another go. A slight tweak here and there could produce something quite stunning with such a good prop. I do like the colours and tone of the first a lot. Again as Pete I am being very critical on what is a good image. I don't mind at all, guys. That's one of the reasons we come here - support and advice. You are both right about the first. A busy teaching day, so I'll see if I can find some time for another attempt. I also managed a blue tinge on the first - bad lighting! I thought you'd opted for a blue rinse! I've added two new ones above. Better? Worse? I'm no good at portraits! Especially my own!! Certainly a lot better and I like them. If it was me directing, I ask you to look off to you right at about 30-45º and try to remember the name of the first girl you kissed. Well, I find the whole thing embarrassing, so I've probably done all I'm going to do with it. I'll send the third, Guittar 3. Added a BW version of the third. Works for me. Much better than the straight shot. Is it considered a 4 course instrument or 5 or what, Rob? Looks like it has 4 sets of two then two individual strings. Where and when was your instrument made, Rob? Thanks, Brian. All good comments. I'd call it a six-course instrument: four double trebles and two single basses. Mine was made by Broderip of London in around 1765. They also made them in Edinburgh, Aberdeen and Glasgow, but I've never seen a Scottish one for sale. I saw this one n a friend's wall and gave him £50 for it, before either of us knew what it was. I had to pay for some repair work. I also did all the research, which I presented at conferences in Portugal and Germany. And I was the first to record an album devoted to it, the music of James Oswald fae Fife. We think the instrument was of German origin, but it really took off in Scotland. The first tutor book for it was published in Edinburgh in 1759, by Robert Bremner. Eventually it found its way to Portugal via the wine trade, and it survives there today in a slightly altered form as the Portuguese Guitar. I urge you to have a listen to it on my website, with the link I gave earlier, as it has a magnificent chiming sound. Interesting Rob. You know, you should do a photographic survey of your instruments. That would be fascinating and there'd be loads of great detail to shoot. I was listening to the 'video' of your music earlier. It transformed be from Mr Grumpy when I shot the plane instead of the ruler I had been using. It must have helped, I didn't break anything. nice bit of history, cool series, i like the pose in the first one, but the pp on the second makes it seem older. You could indeed plus a reflector of some sort. Maybe a cheap folding one from eBay or even a piece of white card. Hmm...maybe. Thanks for the link. Seems cheap and cheerful. ditto pete, you can do a lot with some window light and a reflector.